Our Abruzzese Meatball Appetizer Platter is both convenient and satisfying! 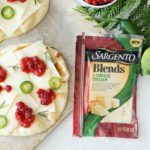 With homemade marinated mozzarella, your favorite marinara and Carando® meatballs, this dish will be the biggest hit of any holiday party! #1: It must be easy to make. 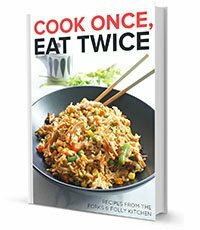 #2: It must be satisfying so that when dinner inevitably takes longer than expected, nobody gets hangry. 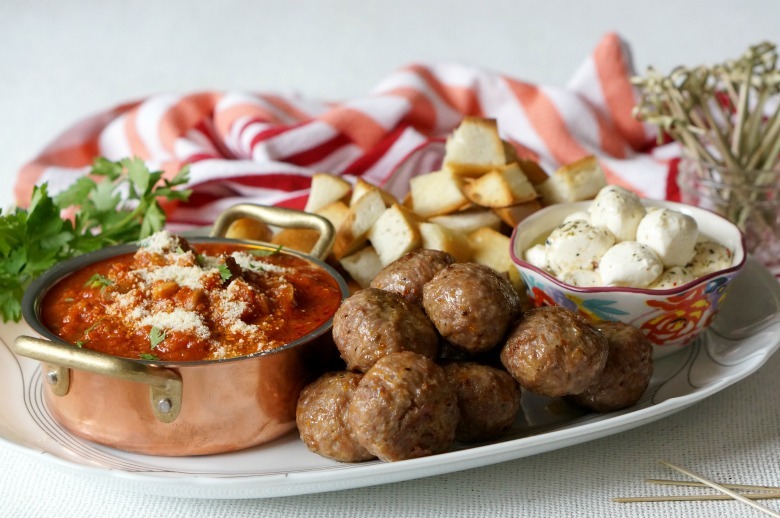 This Abruzzese Meatball Appetizer Platter, loaded with Carando® Abruzzese Fresh Italian Style Meatballs, marinated mozzarella, and toasted garlic bread, ensures that I don’t spend too much time in the kitchen making this comfort-food favorite perfect for the appetizer table. 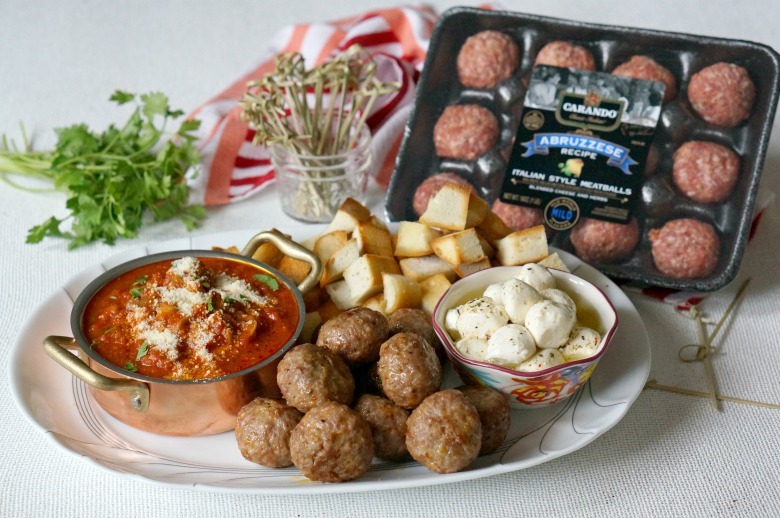 Have you tried Carando meatballs yet? Y’all… I’m a fan. I love meatballs, but I don’t necessarily love making them. Am I overmixing the meat? Will they stay together when cooked? And did I mention the feeling of mixing the raw meat with my hands? No thanks! Using Carando meatballs means I get authentically crafted meatballs with the convenience I crave… especially during the holidays. 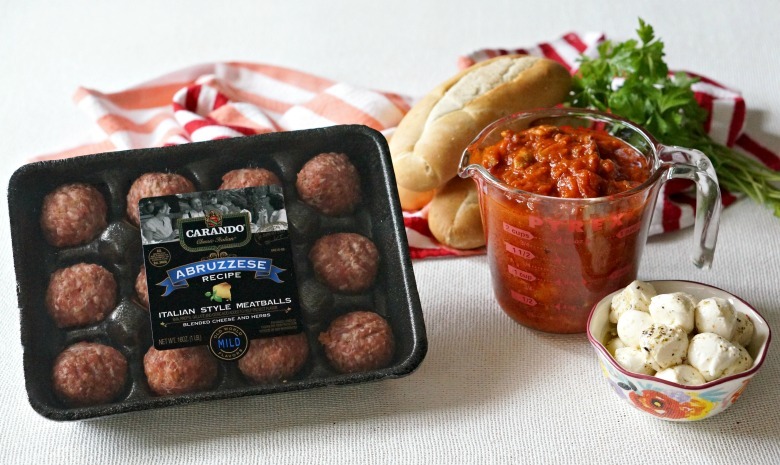 Available at your local Food Lion in the refrigerated meat aisle, the Carando Abruzzese Fresh ItalianStyle Meatballs are perfect dipped in your favorite marinara sauce. 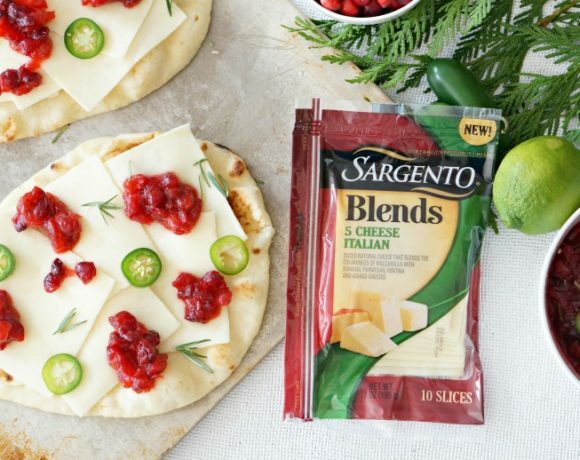 Serve them alongside homemade marinated mozzarella and toasted garlic bread for a satisfying appetizer platter. 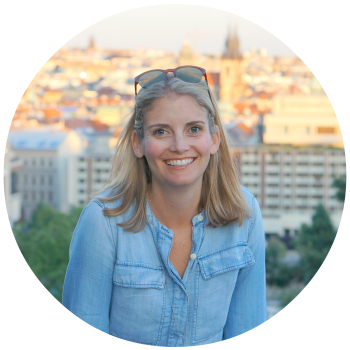 You could even serve it as a main meal… my kids LOVE eating food on a stick! At least a day before you plan to serve the meatball appetizer platter, prepare the marinated mozzarella. In a medium bowl, whisk together 1 cup olive oil, minced garlic, basil, parsley, salt, pepper and red pepper flakes. Whisk until combined. Add drained mozzarella pearls (or chunked fresh mozzarella) to the bowl and toss to coat. Cover and refrigerate at least 24 hours. 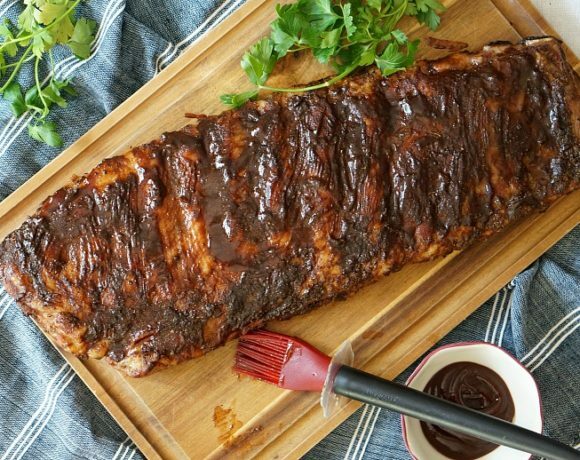 Preheat your oven to 375°F. 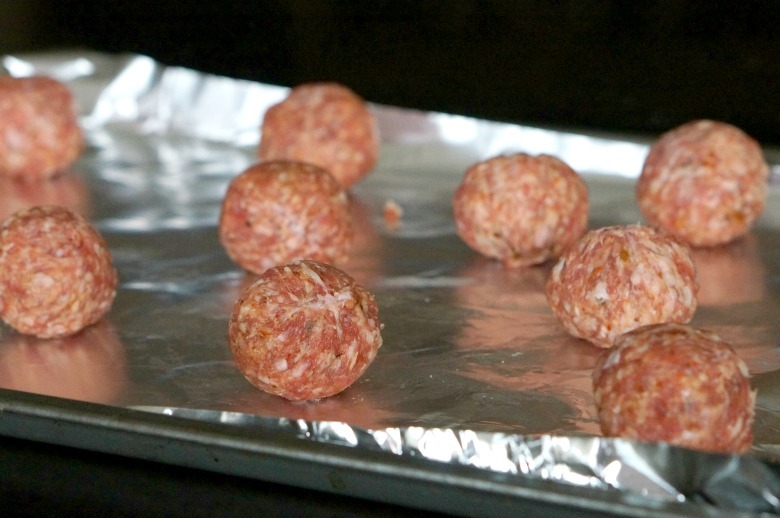 Place the meatballs on a foil-lined baking sheet. Cook for 10 minutes, then carefully turn the meatballs. Continue cooking, another 5-10 minutes until cooked through. Meanwhile, cook the marinara sauce according to package directions. Pour into a medium serving bowl and sprinkle with Parmesan cheese and parsley. 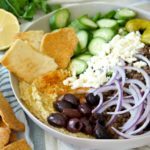 Place a colander over a collection bowl and pour out the marinated cheese. Add the cheese to a serving bowl. Cube the bread into bite sized pieces and place on a foil-lined baking sheet. 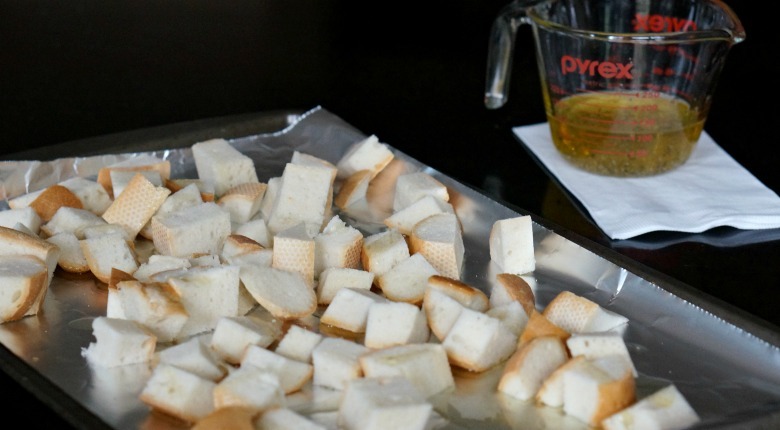 Toss the bread with a few tablespoons of the collected herb-oil from the cheese. 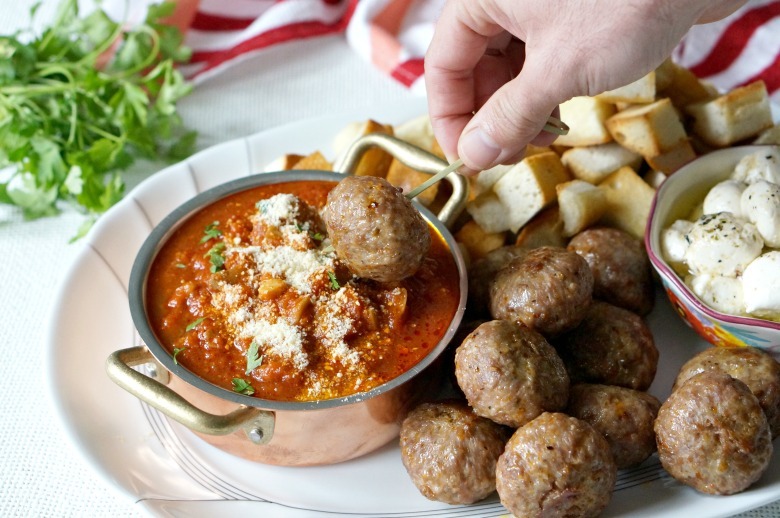 When the meatballs are cooked through, preheat your oven broiler on low. Place the bread in the middle of the oven, allowing it to toast. Keep a watchful eye on it so it doesn’t burn. 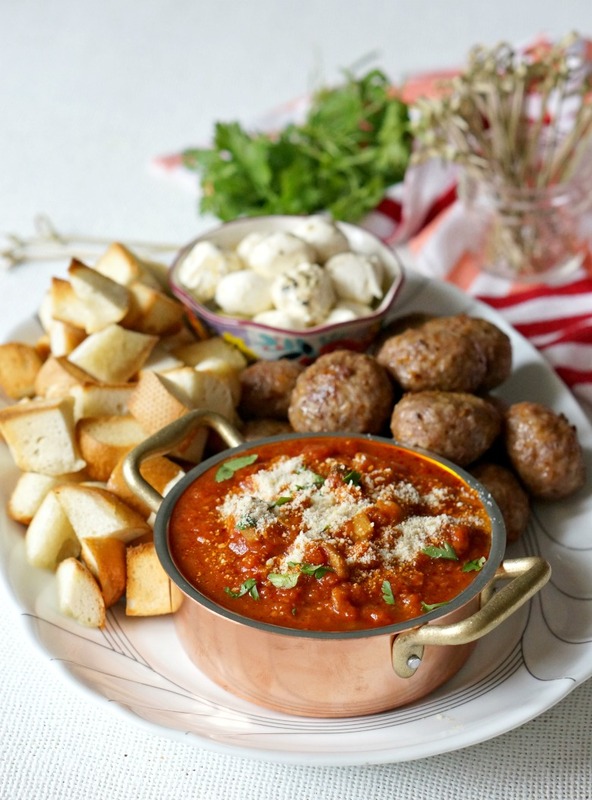 Remove from the oven and add the meatballs and toasted bread to the platter along with the cheese and marinara sauce. 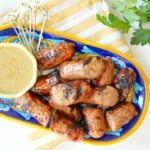 Serve with cocktail toothpicks or fondue skewers and enjoy! Our Abruzzese Meatball Appetizer Platter is both convenient and satisfying! With homemade marinated mozzarella, your favorite marinara and Carando meatballs, this dish will be the biggest hit of any holiday party! At least a day before you plan to serve the meatball appetizer platter, prepare then marinated mozzarella. In a medium bowl, whisk together 1 cup olive oil, minced garlic, basil, parsley, salt, pepper and red pepper flakes. Whisk until combined. Add drained mozzarella pearls (or chunked fresh mozzarella) to the bowl and toss to coat. Cover and refrigerate at least 24 hours. 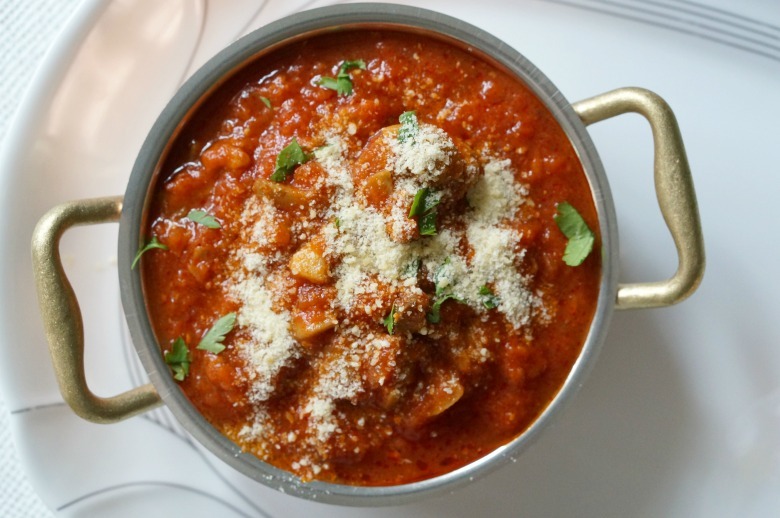 When the meatballs are cooked through, preheat your oven broiler on low. Place the bread in the middle of the oven, allowing it to toast. Keep a watchful eye on it so it doesn't burn. 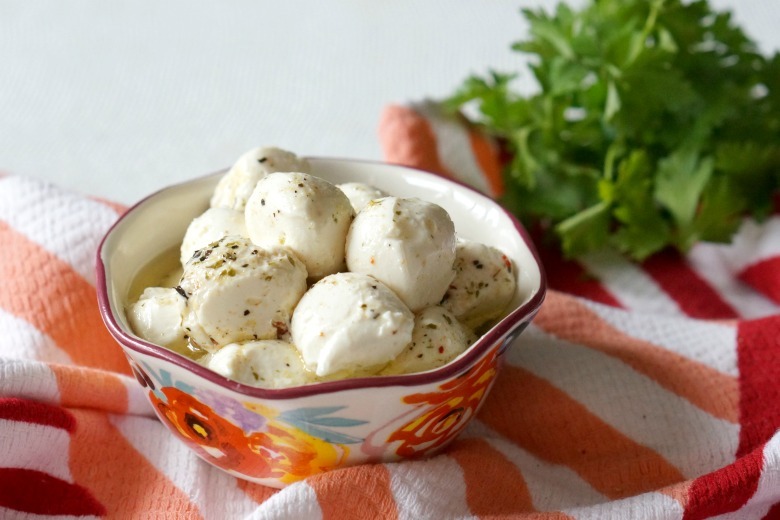 If mozzarella pearls are unavailable, simply cut up fresh mozzarella into 1" cubes. Be sure to use the Entry Point kiosk to receive special deals and offers on Carando meatballs when you scan your MVP rewards card at your local Food Lion between 12/5-12/12/18! 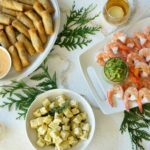 Need some additional party food ideas for the holidays? Be sure to grab some crostini while at Food Lion to make these three toasts, perfect to add to your holiday spread!